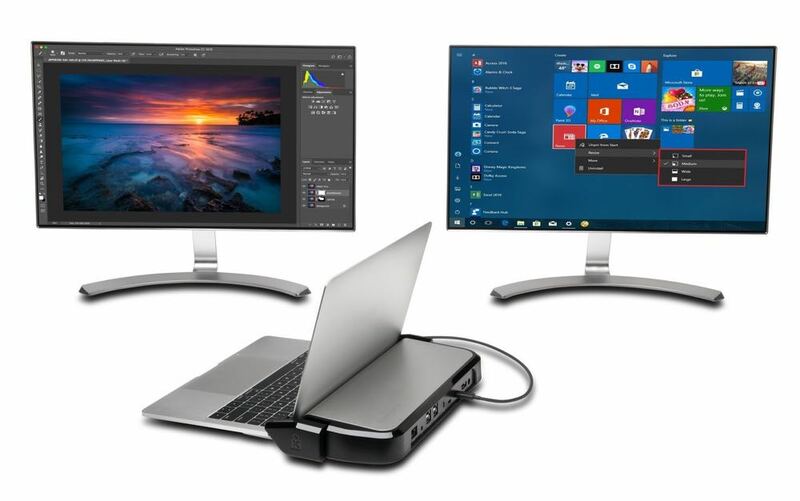 The Kensington LD5400T Thunderbolt 3 Dock is an excellent laptop companion for those who want to expand their laptops capabilities and work on a grander scale to increase their productivity. For many people, their laptop is the centre of their lives. The Kensington LD5400T Thunderbolt 3 Dock takes that laptop and makes it more versatile than ever. 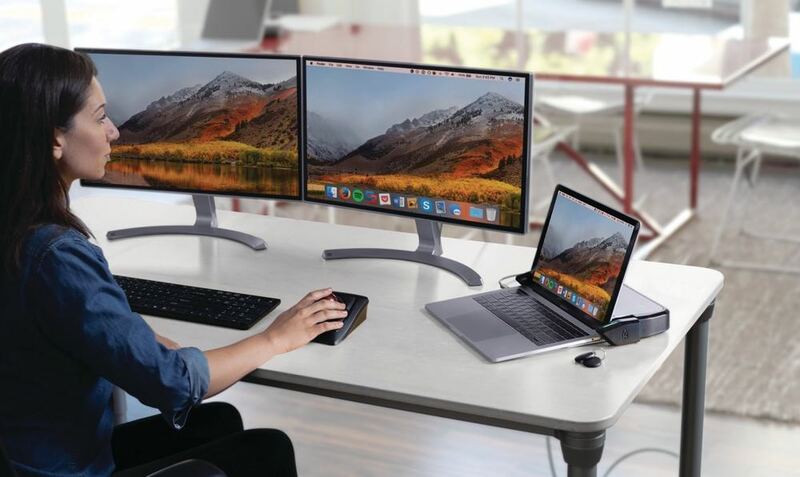 The dock expands the laptop’s connectivity with even more ports and the ability to add monitors to your workflow. Kensington has combined its two main strengths with this product. The first is the ability to come up with useful accessories for your computer and the second is its next-generation laptop locking technology. So you know the Kensington LD5400T is both useful and secure. 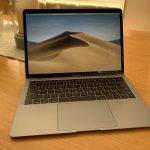 The device works with both Windows and Mac laptops up to 15-inches in size and has adjustable security arms on either side to hold your laptop in place securely. It comes with a small fob that you tap on the side of the unit to unlock the security arms. This prevents anyone just taking your laptop when you’re not there. 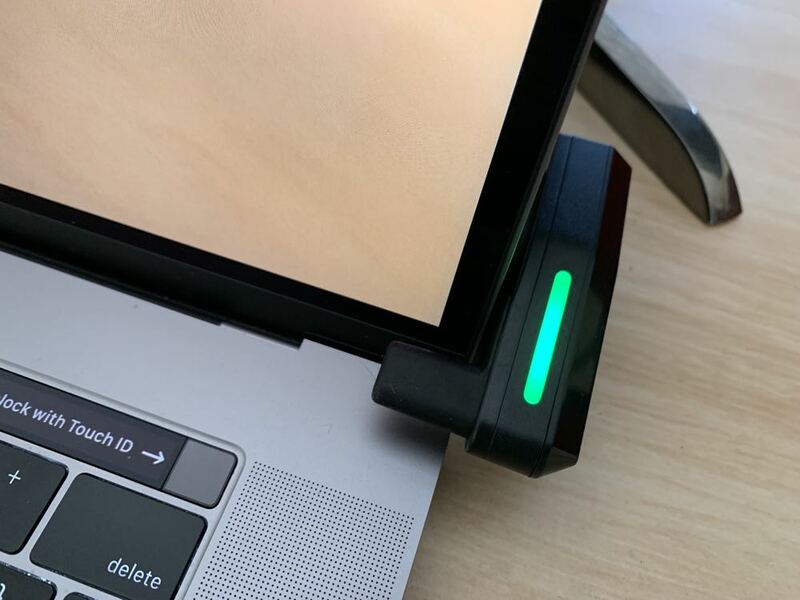 The actual dock itself can also be secured to the desk with a steel cable which has a design that conforms to Kensington’s industry-leading testing standards. Design-wise, the Kensington LD5400T is about half the size of a laptop and five times the thickness and rests behind your laptop when it is sitting on a desk. This puts it out of your way and out of sight but there is still the matter of reaching around to the back to access the many ports available to you. These include a Gigabit Ethernet port, a 3.5mm audio input/output, for USB-A ports, a Kensington security slot, two Thunderbolt 3 ports (that look like a USB-C port) along with a Display Port v1 .2. That’s a lot of additional connectivity on top of what you already have on your laptop. 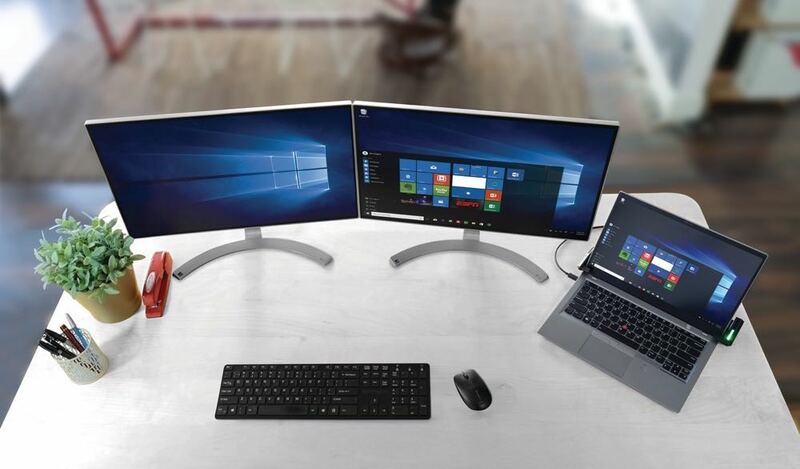 The onboard Thunderbolt 3 ports allows users to add dual 4K monitors or a single 5K monitor. 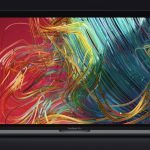 This is ideal for those who want to work with a larger canvas while still having their laptop as their main computer. 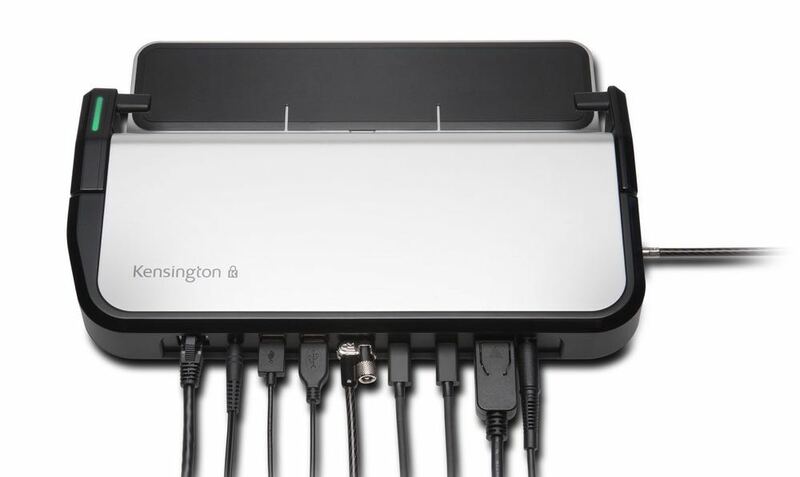 We used the Kensington LD5400T dock with our 15-inch MacBook Pro and those additional ports located on the back of the device made it possible to keep those cables connecting a monitor out of your way. We still had four Thunderbolt 3 ports on the MacBook Pro which we could use for charging or data transfer. 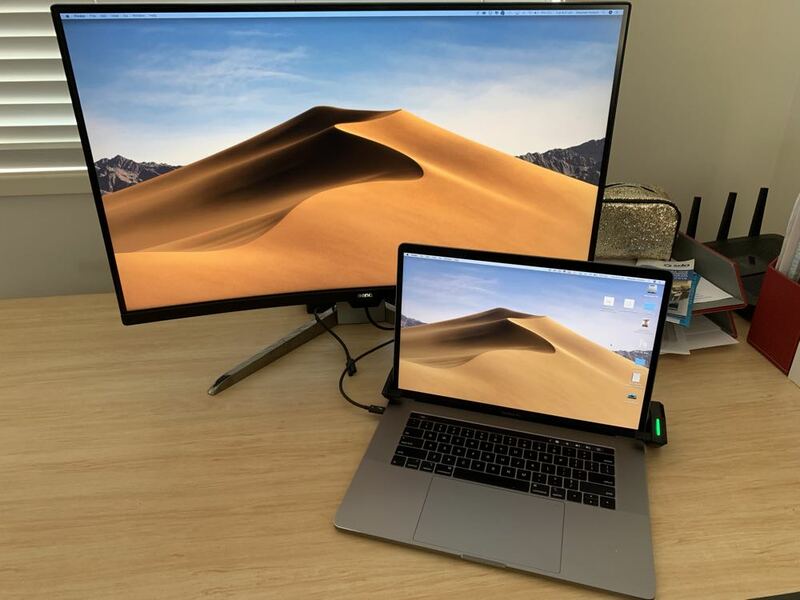 We needed to use one of the USB ports to connect our laptop to a USB-C port on the dock which in turn was connected to a 32-inch monitor. Many might even be asking why go to the trouble of buying a product like this when a smaller and more affordable USB-C dongle might do the trick. 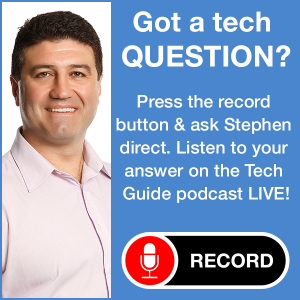 For a start, a dongle can’t provide high speed Thunderbolt 3 ports. 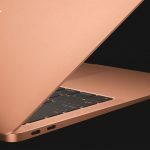 But they can provide USB-C and a microSD and full-size SD card slots. Memory card slots are things you won’t find on the Kensington dock. It also doesn’t have a HDMI slot to connect your laptop to a monitor or smart TV. Again a small dongle can come to the rescue here. But the dock’s Thunderbolt 3 ports trump the HDMI port in terms of speed and capacity so you’re not really missing out. 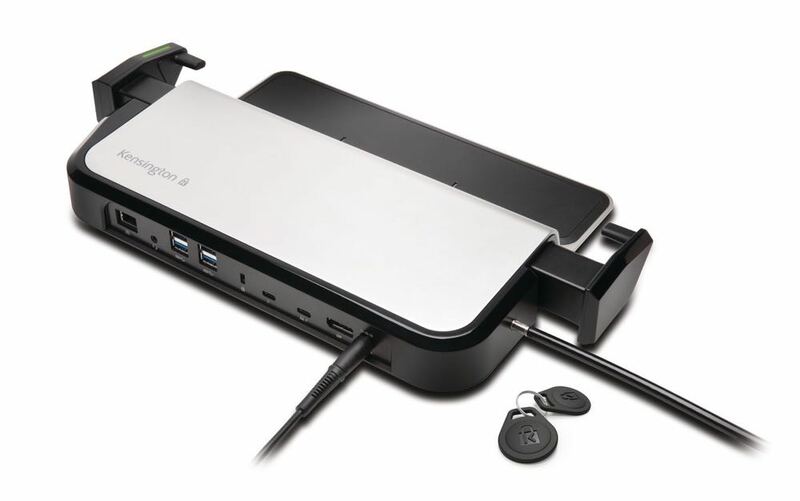 The Kensington device is ideal for those who are hot-desking or sharing a workspace where they can bring their laptop and connect to the dock and their monitors and peripherals. Not many laptops have an Ethernet port for directly connecting an internet cable but that’s just one other advantage of the Kensington LD5400T dock. On the security side, the dock comes with a cable so you can literally lash it to the desk and two fobs that will unlock the adjustable security arms and allow the laptop to be removed. There is also a model that comes with admin control so IT administrators can have master access to all stations especially those in hotels, airport lounges and other shared workspaces. When a laptop is locked inside the dock you can’t completely shut the lid of the laptop. Best we could do was tilt the screen down slightly to open up the view to the monitor. When we connected our laptop to the Kensington dock and hooked it up to our monitor we had to move the dock to the side so we could get a clearer view of the larger screen. This meant whenever we needed to type or use the trackpad we had to turn to the side. This isn’t an issue if you decide to have a seperate keyboard and mouse linked to the dock as well. For those with a desk big enough, you can easily move the monitor further back and still have the laptop front and centre. We would have liked to have seen memory card slots on board the dock. I’ll still have to hang onto my USB-C dongle which offers these slots. The other thing we did like was the fact that the ports were right on the back of the product which meant we had to get up from our desk to make or adjust the connections. These are only minor issues and hardly a deal breaker. 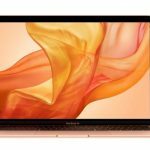 But the product isn’t cheap at $449.99 – it’s a significant investment and at that price will appeal only to the truly serious users.